We’d love your help. Let us know what’s wrong with this preview of Shrinking Sinking Land by Kell Cowley. One week before the Global Mandatory Hibernation and Flea Wheeler will do anything to avoid a long winter underground. A claustrophobic climate refugee who has been living rough on the flooded streets of Manchester, Flea dreads the day she’ll be forced into shelter so a geoengineering experiment can attempt to reverse the chaotic effects of global warming. Armed with nothi One week before the Global Mandatory Hibernation and Flea Wheeler will do anything to avoid a long winter underground. A claustrophobic climate refugee who has been living rough on the flooded streets of Manchester, Flea dreads the day she’ll be forced into shelter so a geoengineering experiment can attempt to reverse the chaotic effects of global warming. Armed with nothing but her stolen umbrella, Flea is on a mission to stay on the surface and somehow survive the extreme weather. To ask other readers questions about Shrinking Sinking Land, please sign up. I really enjoyed this book. Having not read any Young Fiction before, I wasn’t sure what to expect, but the fast pace and believable characters kept me hooked to the end. I loved the way that Kell Crowley keeps your interest by introducing so many twists and turns and makes you eager to find out what happens next. Loved this book! It was a captivating story about the devastating effects of climate change. The mysteries kept me guessing until the end. However my favorite aspect were the characters. I cared so much about every single one of them. Even the ones I wanted to hate. All of them had an interesting back story and believable motivations. Even though there were sides, no one was truly a 'bad guy'. It made for one of the best-written book I've read. "There are three main ways an umbrella can save your life" (Cowley, 1). Shrinking Sinking Land is a YA dystopian climate fiction novel revolving around the earth we live in and what could happen if we don't take care of our earth - and aliens, of course. The novel starts off following Flea, a young girl trying to get her mother out of a sinkhole caused by the extreme weather. We are quickly introduced to the scouse accent and Liverpool dialect that she shares with her mother, demonstrating an od "There are three main ways an umbrella can save your life" (Cowley, 1). The novel starts off following Flea, a young girl trying to get her mother out of a sinkhole caused by the extreme weather. We are quickly introduced to the scouse accent and Liverpool dialect that she shares with her mother, demonstrating an odd relationship between the two. The first thing I noticed is that there is a lot of English slang presented right off the bat in this novel. I found the conversation hard to follow as I'm not English (UK) and it definitely distracted from the story and made it hard to continue. However, once you get through the beginning with Flea and her mother, the dialogue starts getting more understandable, and you can focus more on the plot. The plot was well written and kept my interest throughout the read. I liked that we got to see two point of views throughout, getting a feel for the different types of people trying to survive the climate and counting down to the Global Mandatory Hibernation (see blurb). I also really liked that at the beginning of some chapters, we get a description of certain terms used throughout the novel referring to the climate fiction aspect of the story. I liked the variety of characters we got to see all experiencing the same event. Flea, Dylan Moon, Nessa, and Bunker Brat were all really interesting to learn about and they worked really well with each other. The chemistry which Cowley created makes the plot even better. The message I took away from this novel is that not everything is as it seems. The story really takes you into a certain direction until it doesn't. All of a sudden, you're questioning everything that you've read, because the author has a way of making you believe one character over another. It think the only thing I would ask for more of is descriptions of non traditional sayings, or certain words. We do get that throughout the book, which I really liked, but I felt that there was a need of a few more to clear up dialogue. Shrinking Sinking Land is an excellent work of YA dystopian climate fiction by debut author Kell Cowley, and the first in a continuing series with Odd Voice Out Publishing. The central plot follows our hero Flea Wheeler, a mixed race girl born into a political decision she had no say in: the Geolution. Global Mandatory Hibernation is coming, and the population of Great Britain must take cover in underground shelters as climate change rocks the world with dangerous floods and terrifying storms. F Shrinking Sinking Land is an excellent work of YA dystopian climate fiction by debut author Kell Cowley, and the first in a continuing series with Odd Voice Out Publishing. The central plot follows our hero Flea Wheeler, a mixed race girl born into a political decision she had no say in: the Geolution. Global Mandatory Hibernation is coming, and the population of Great Britain must take cover in underground shelters as climate change rocks the world with dangerous floods and terrifying storms. Flea braves the storms on a daily basis, a plucky outcast with little to lose, and the threat of being stuck underground terrifies her due to her intense claustrophobia. It’s only when she meets a group of eco-rebels still trying to dig out the real conspiracy behind the Geolution that Flea discovers there may be another way out. What I adore most about Shrinking Sinking Land is the authenticity of Kell Cowley’s teenage protagonists. They speak with contemporary voices and realistic reactions, both amusing and heartbreaking as the plot expands. I love Flea’s defiance and her fighting spirit against impossible odds, and her fellow castmates fill out a diverse roster of disability, ethnicity and lgbtq personas that are fascinating and highly engrossing to read about. The plot too is enticing as the threat of the Geolution and hibernation hangs over each one of them, and I could wait to grab the next chapter and keep unveiling the mysterious conspiracy that Flea and Dil are working towards. Overall, this is a superb debut novel sure to entertain and engross its audience. Five stars! This is simply a good book! The characters feel real, the plot has pace and depth and there are plenty of twists and turns to keep the reader turning the pages. No spoiler alerts in this review. For me the author has cleverly woven a picture of the future that resonates with every climate news story that we see around the world today and fully engaging the reader as she does so. Moreover Kell Cowley achieves this with a wit and insight that provokes the reader and leaves them with thoughts and qu This is simply a good book! The characters feel real, the plot has pace and depth and there are plenty of twists and turns to keep the reader turning the pages. No spoiler alerts in this review. For me the author has cleverly woven a picture of the future that resonates with every climate news story that we see around the world today and fully engaging the reader as she does so. Moreover Kell Cowley achieves this with a wit and insight that provokes the reader and leaves them with thoughts and questions long after the final page. I also feel her main protagonist Flea displays the drive and determination that is urgently required by the present and future generations in order to solve our eco-problems. I would put this book on the recommended reading list for all students in our Schools and Colleges! I blame this book for not talking to my husband for 2 days 😂. I could not put it down. I found myself snatching 'just one more page' as I couldn't stop thinking about what Flea and her friends were going to encounter next. My mind was whirring with theories throughout. Very well written! I can't wait for the next one. Teenage climate refugees, weird weather experiments, extreme greens, space cases, cleaner cops, umbrella ninjas and cyborg cats. The Global Mandatory Hibernation is looming as the storm clouds gather over the last week of the surface world. Check out this story of some crazy kids fighting to stay above ground. Taking a month to read a book (seriously!! )- but I got there despite the sink holes of daily life - and so glad that I did. Felt really attached to the characters as they journeyed through life and came alive. Well done Kelly. But when is the next book coming out. These days, young adult dystopian novels are a dime a dozen but Shrinking Sinking Land by Kell Cowley has taken the genre in a whole new direction that is both fascinating and fun. The story is set in Great Britain in the not-too-distant-future when violent weather patterns have become the enemy of mankind. The government is sending everyone underground for an enforced six-month hibernation while they do experiments on the atmosphere to get things back to normal. 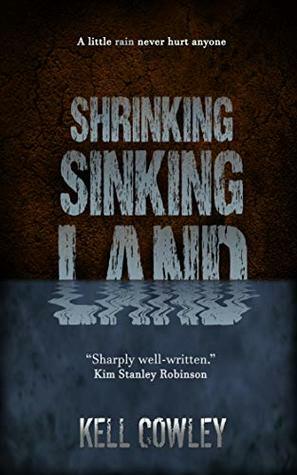 The plot focuses on a ragtag gro These days, young adult dystopian novels are a dime a dozen but Shrinking Sinking Land by Kell Cowley has taken the genre in a whole new direction that is both fascinating and fun. The story is set in Great Britain in the not-too-distant-future when violent weather patterns have become the enemy of mankind. The government is sending everyone underground for an enforced six-month hibernation while they do experiments on the atmosphere to get things back to normal. The plot focuses on a ragtag group of people who have no desire to go underground and are suspicious of the motives behind the enforced hibernation. The colorful cast of characters includes Dylan Moon, an internet revolution leader with only a handful of followers, and Flea, a girl from the lower class who is claustrophobic and is ready to fight off anyone who tries to force her to go underground with her trusty umbrella.